The new Twitter layout brings new opportunities for using images. But the size and shape of images required, especially for the header, is tricky to get right. Should you stretch your logo (er, no), use a generic photo library background or search for a single picture which tells your story? There are still lots of organisations and people who haven’t made the switch yet, let’s look at some who have. This example from @OxfamGB uses one very powerful image (of a person looking directly at us) alongside a red banner about the appeal and JustText Giving details underneath. As Twitter is not traditionally used for fundraising (see previous post on donating in 140 characters), the header presents a brilliant opportunity. 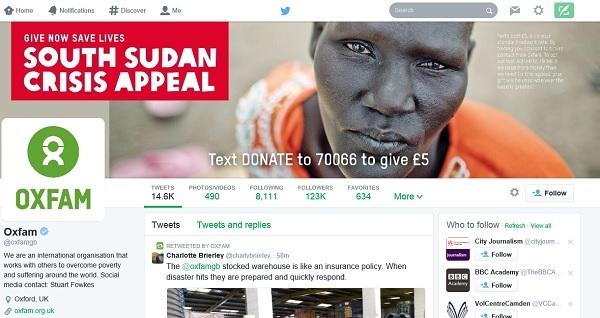 Oxfam could reinforce the header by pinning a tweet about the appeal so it appears at the top of the page. This would drive more traffic as nothing in the profile space is clickable. 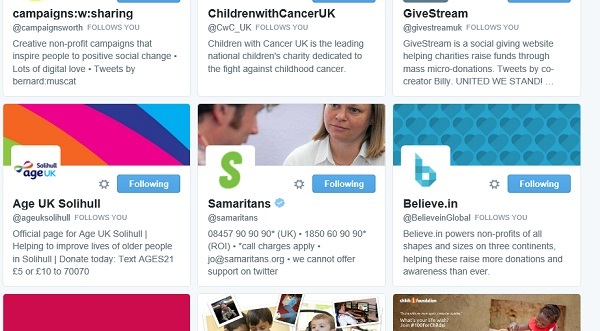 Child’s i Foundation are using their profile to promote their latest fundraising campaign. The pinned tweet works well here especially as it uses a different but similar picture. 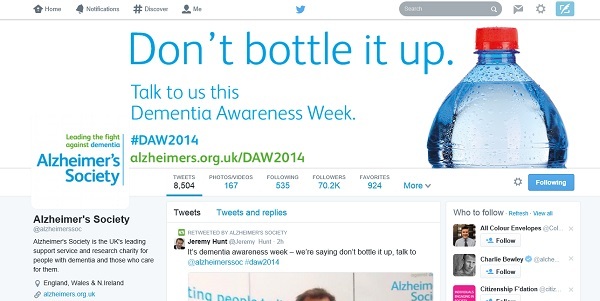 Alzheimer’s Society are using their header to promote their latest campaign, Don’t bottle it up. They have included their #hashtag and link. It can be difficult to find one strong image, especially one which tells a story, is easy for everyone to understand and works in the letterbox shape (1500 x 500 pixels). Mencap use one strong positive image of a man and boy, both smiling. This complements their friendly bio (‘Hi, we are Mencap. Everything we do is about valuing & supporting people with a learning disability, their family and carers’). What does your picture say about you? A photo of a single person works well as a fundraising persuasion tool but this is social media so maybe your image should be a reflection of your inclusion? There are a few examples of this such as this one from Parkinson’s UK and The Muscular Dystrophy Campaign. Play to your strengths. What images do you have which you know work well? For example Guide Dogs use puppies. But what if you don’t have a stock of strong pictures or your cause doesn’t lend itself to a photo? A graphic can work. 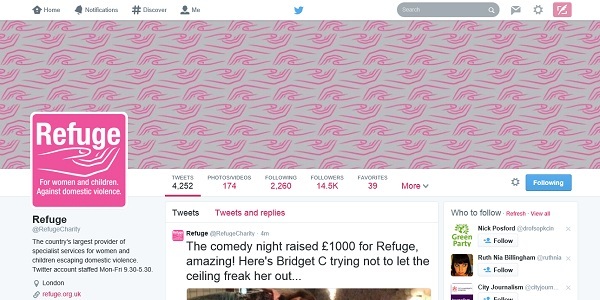 Refuge here uses a repeated image from their logo. Lighthouse, a suicide prevention charity in Belfast use a google map showing their location. Headway East London use a painting. 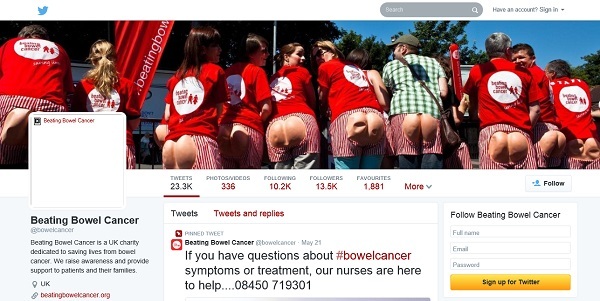 Your strong image doesn’t have to be serious, it can be cheeky like Beating Bowel Cancer‘s. 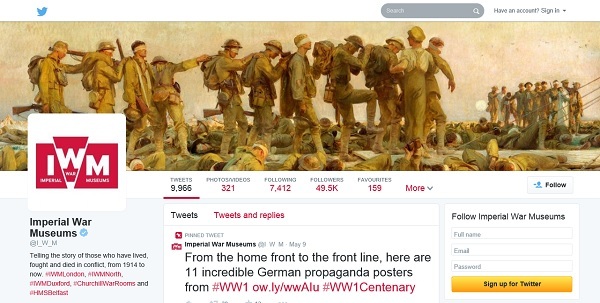 Finally, museums, galleries and heritage organisations have an amazing opportunity to showcase their collections as this example from the Imperial War Museum shows. If you are using one strong picture, think about how often you will change it and where else it appears. Will people get tired of it after a while? How many other places it is appearing? It may be useful to use one image across your social media channels and change them to something else all at the same time. Or have one strong image per channel and use this permanently. Check that your header image works well at 1500×500 pixels. Does it tell a story? Is it cropped in the right way and uncluttered? Make sure that the image and / or text is not blurry or pixelated. Start with a big picture and reduce. You can’t make small pictures bigger – you’ll lose definition. Is your logo / avatar clear at 400 x 400? Does it still work when reduced to tweet size? Check how your image appears using different browsers / devices etc. You don’t want to do a Good Morning Britain. Images can look subtly different but enough to stop them making sense / working as well. For example, look at Samaritans’ profile – in the web version, the woman’s eyes are oddly cropped out but in a list of profiles, they appear! create a Twitter header in three easy steps (Big Brand System). What examples have you come across which have inspired you (in a good or bad way?) 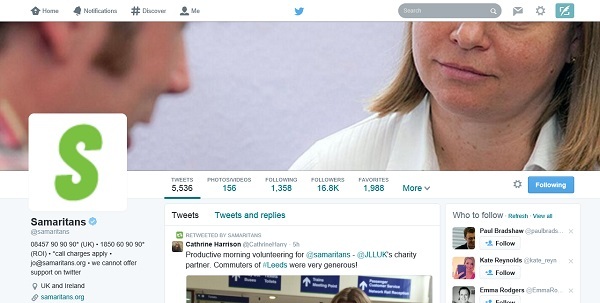 What have you learnt about using the new-look Twitter? Please share your comments here. Please also get in touch if you’d like me to help you with social media. I am a freelance web editor and trainer and can help give your digital communications a healthcheck and ideas injection.